Long story, but my dad invited me to see ‘Do You Believe?’ last weekend for Easter. Because I do love my parents and still hope that we can salvage our relationship, I went. – Oh hey, random dude dragging wooden cross through the city, asking passersby, “Do you believe in the cross of Christ?” This would totally happen in Texas. – Wait, this movie is set in Chicago? – Pastor’s reaction to dude with cross: typical of suburbia megachurch Christianity. – Why is the gang all young black guys? Pretty sure this is a stereotype. Racism…research how real gangs operate, people. – Love this ex-convict guy, Joe. Finally, Christian films featuring characters with checkered pasts and tattoos. And he’s so genuine, doing janitorial work for the church and helping Samantha and Lily, the homeless mom and daughter. I’ve met people like Joe in churches, the ones with the dramatic testimonies. – Speaking of which, mom and daughter look a little too clean and well-dressed to be sleeping out of their car and in shelters. – But pointing out a struggling single mom who thought she was going to be a homemaker all her life? YES. Take that, patriarchy. – Pastor’s sermon about dude with cross is annoying. His object lesson, splattering a cross with red paint, is gory and appeals to guilt. All the little wood crosses in the pews are cheesy. – Pretty Boy’s escape from the police after gang fight by hiding in the church service, praying Jesus will save him from being arrested? Accurate. – This movie has more honest emotions than other Christian films. Cybil Shepherd’s character resents that God didn’t prevent her daughter’s death, Lily’s mother doesn’t trust people or a divine being, Kriminal hates televised church services for manipulating his grandmother and taking all her money. – Hey, there’s actually a drug dealer in this movie who isn’t black. One devilish-looking white dude. – The filming is smoother, more effective than typical Christian productions. Someone knows their camera angles. – Have the filmmakers studied Tarantino? The character snapshots with intertwining storylines remind me of Pulp Fiction or the various people on a religious pilgrimage in Chaucer’s Canterbury Tales. – So Pretty Boy reads a motel Bible, his grandmother sings him “Amazing Grace” just like when she was putting him to bed as a child, and he decides to give the stolen drug money to the church like Judas returned the 30 pieces of silver. Love him, and again, this would actually happen in the South. – This is the first Christian movie I’ve seen where the directors and screenwriters created real types of characters within evangelicalism. But the nonbeliever characters still need work. – #@&%! Christian films never make me jump. The camera angle was perfect, didn’t expect to see Kriminal aiming a gun at the pastor when he gets off the phone. – Realistic portrayal of mental illnesses like PTSD and self-harm. The returning veteran and the lonely college girl who cuts are sympathetic characters, but they aren’t patronized, either. – Ahahahahahaha. The cutter and the veteran stand on opposite sides of the bridge, thinking of jumping. They notice each other, glance over awkwardly. “I guess I just wanted a little privacy.” “Me too.” “Say, do you want coffee?” And they unwittingly save each other. Adorable. – Paramedic doesn’t know how else to comfort a dying man, hands him the cross from the sermon. The man repeats the sinner’s prayer, tear rolls down his face and sunlight streams down on him as he says “Jesus!” and dies. >.< …cheesy. I’m sorry, that’s not usually how this stuff works. It’s not like instant oatmeal, just add water. – The paramedic being sued for proselyting would likely happen. The in-your-face stuff does make other people angry. He meant well, but it probably wasn’t the best approach. And when he asks “if you were on trial for being a Christian, would there be enough evidence to convict you?” and assumes the backlash is persecution, it just comes off as arrogance. – Older couple who lost daughter volunteer at local soup kitchen and take in Samantha and Lily. Ex-convict Joe also gives them a place to sleep one night. And the pastor’s wife has a change of heart and says pregnant homeless girl can move in with them. This is refreshing, people actually attempting to be the hands and feet of Jesus. Fundamentalism often writes off charity and social gospel messages as heretical. – The bitter doctor / seasoned laywer husband and wife complaining about others praying at dinner seems to be the secular face for the movie? I understand their perspective, though. Nonbelievers in the Bible belt are the minority and they get picked on. – And…the car crash scene at the end. ONE CHARACTER IS NOT MIRACULOUSLY SAVED. More realism. This is progress. – I’m pretty sure near death experiences with leukemia aren’t like that. – Now I just feel like this entire movie was an advertisement for the Newsboys’ song at the closing. 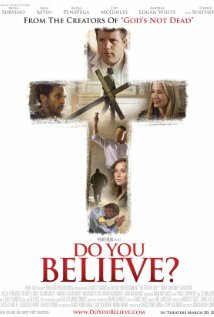 ‘Do You Believe’ still has five or six cringeworthy moments, it’s still heavy-handed. But the film also shows signs that Christian directors are responding to criticisms about the genre.